American portrait painter. With Copley he was the outstanding American portraitist of his period and he is regarded as the creator of a distinctively American style of portraiture. Much of his early career was spent in Scotland (c. 1771-72). England (1775-87), and Ireland (1787-92). After he settled permanently in America in 1792, he worked briefly in New York City, then moved to Philadelphia, and finally settled in Boston in 1805. He quickly established himself as the outstanding portraitist in the country and painted many of the notables of the new republic. 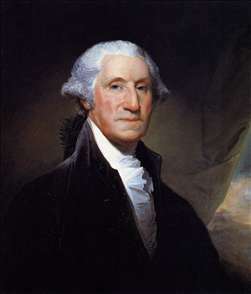 His portraits of George Washington are his most famous works - he created three types, all of which were endlessly copied: the Vaughan type (National Gallery of Art, Washington, 1795), the Lansdowne type (Pennsylvania Academy of Fine Arts, Philadelphia, 1796), and the Athenaeum type (Museum of Fine Arts, Boston, 1796), which is one of the most famous images in American art, being used on the country s one-dollar bill. Stuart s style is notable for its strength of characterization (Benjamin West said he nails the face to the canvas ) and its fluent brushwork. His work had great influence on the next generation of American painters. See more details about "George Washington"